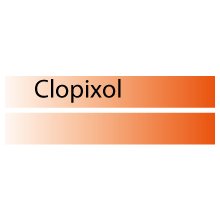 Clopixol® (zuclopentixol) is a typical antipsychotic drug of the thioxanthene class used in the treatment of psychotic states, such as schizophrenia, mania, organic brain syndrome especially when accompanied by pronounced anxiety, hostility, aggressiveness and psychomotor agitation. Mentally handicapped patients with behavioural disturbances. It is available in several formulations: tablets, oral drops, depot injections and Acutard injections.